Did you know that the Sisters of Providence have had a presence in Asia since 1920? Six sisters responded to a call to the foreign mission, echoing Saint Mother Theodore Guerin’s response to go to a foreign land in 1840. Currently, we minister in two locations, including Miracle Home and Providence University. We also have several women in formation in the area. 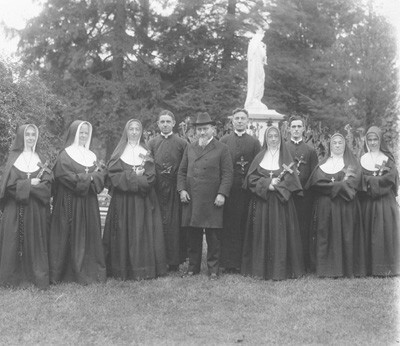 The first SP missionaries to China prior to departure Sept. 29, 1920: (from left) Sisters Winifred Patrice O’Donovan, Eugene Marie Howard, Marie Gratia Luking, the Rev. F.X. Clougherty, the Rev. J.N. Tacconi, the Rev. H.P. Lawton, Sister Clare Mitchell, the Rev. J. Kerin, Sisters Mary Elise Renauldt and Marie Patricia Shortall. In 2015 and 2016, we welcomed guests and alumnae from Providence University. Adding to the excitement was the presence of current Providence University students who spent a year at Saint Mary-of-the-Woods College as exchange students. Providence University alumnae and spouses visited Saint Mary-of-the-Woods in May 2016 and enjoyed a guided tour of the Saint Mother Theodore Guerin shrine as well as many other activities. Most of the group was from the Chicago area or Taiwan. Mary Schafer coordinated the event. Those who took part in the tour included Mary Schafer, Jim Schafer, Dorina Cheng, Emma Yeh, Juliana Tseng, Justina Lin, Grace Kung, Rita Wu, Ann Wu, Joe Kung, Terry King, Joanne Kuan, Richard Kuan and Henry Kuan. They were accompanied by Sister Anna Fan and Sister Nancy Nolan. For a brief history of the Mission in Asia, click here. Click here to read portions of the article “Day of Departure” in the November 1920 issue of The Aurora, a publication of Saint Mary-of-the-Woods College. Click here to read more about The Bugle Call. Click here to read more about Archival Treasures from the Mission in Asia.